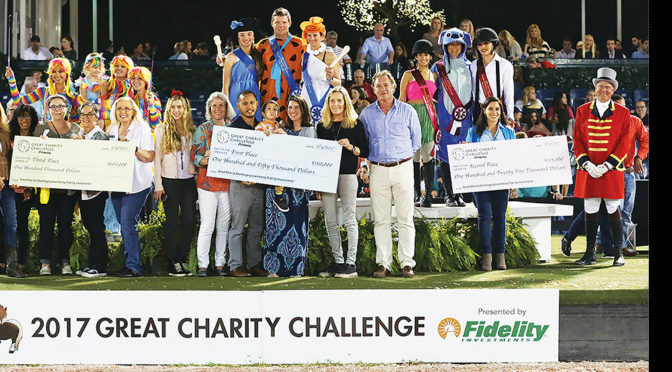 The ninth annual Great Charity Challenge, presented by Fidelity Investments, will be held at the Palm Beach International Equestrian Center on Saturday, Feb. 3. Dozens of Palm Beach County charities will compete to receive a share of the $1.5 million purse during the exciting pro-am jumping competition held during the popular Saturday Night Lights series at the Winter Equestrian Festival. The Great Charity Challenge, founded in 2010 by Mark and Katherine Bellissimo of Equestrian Sport Productions, and their daughter Paige, has distributed more than $10.8 million from the equestrian community to 220 local nonprofits. All of the money raised gets distributed in one evening every year, with first place receiving $150,000 and all participating charities being guaranteed a minimum of $15,000. While the public excitement takes place one day of the year, that money is put to work year-round at the dozens of charities that receive a slice of the winnings. The Kids Cancer Foundation has received more than $200,000 from the Great Charity Challenge, having been lucky enough to participate at the event three times, including taking third place in 2016. KCF has also been selected for the 2018 event, which means a guaranteed minimum of $15,000 in additional support. The nonprofit’s mission is to provide hope and support to children and families in Palm Beach County battling childhood cancer. It currently provides assistance to more than 450 families. When children are diagnosed with cancer, their life immediately changes. Instead of school, playgrounds and parties, their new reality is chemotherapy, doctor visits and hospital stays. The effect on the entire family is dramatic — and often, traumatic. Doctors and nurses provide the medical care, but families need more in order to get through this stressful and terrifying time. The Kids Cancer Foundation provides comprehensive and easily accessible supportive care services. The nonprofit works to educate families about their child’s diagnosis and treatment, providing physical, emotional and financial support throughout the difficult journey. There are approximately 15,780 new cases of pediatric cancer diagnosed in the United States each year. The work done by the Kids Cancer Foundation has been shown to increase both a child’s quality of life and chance of survival. Naturally, the emotional and financial toll that Emma’s health has had on this family is devastating, but the Kids Cancer Foundation has been able to provide the financial and emotional support Emma and her family need during this difficult time. “They now have a small apartment close to the hospital, and Emma’s mother has been able to re-enroll in school to complete her nursing degree, so she will be able to financially support herself and her three precious daughters,” O’Boyle said. Bella’s Angels, a local nonprofit that helps families who have children with lifelong physical disabilities, won $125,000 for taking second place at the 2016 Great Charity Challenge. Bella’s Angels assists families with children’s medical expenses that insurance doesn’t cover. An example of Bella’s Angels’ work resides in MacKenzie, one of 400 youngsters in the world with the rare genetic disorder Tetrasomy 18. In 2017, Adopt-A-Family of the Palm Beaches was one of the Great Charity Challenge’s big winners, taking second place and winning $125,000, plus an additional $5,000 from the Zeigler Family Foundation, in what started out as a wildcard spot. Since 2014, Adopt-A-Family has received $240,000 in support from the GCC. Adopt-A-Family is dedicated to strengthening families with children in their efforts to achieve stability and self-sufficiency by providing access to all-encompassing services. The money from last year’s GCC enabled the agency to make significant strides in three areas. First, the award enhanced Project Grow, the agency’s afterschool program for homeless and impoverished elementary school students by covering the cost of classroom supplies, nutritious daily snacks, camp t-shirts and field trips. Second, Adopt-A-Family increased its effectiveness through administrative infrastructure improvements, including IT upgrades, new accounting software, a web-based phone system and staff training. Finally, the nonprofit increased its capacity by investing GCC funds in the agency’s newest project, Third Street Homes, a 14-unit affordable housing program for families at imminent risk of homelessness. The money enabled the agency to complete the demolition of the deteriorated structures on the property and hire a program manager and architect. But Adopt-a-Family’s real impact hits home with the story of Karen, a girl who spent her early years moving frequently between foster homes due to her behavioral issues. She reunited with her mother at Adopt-A-Family and joined Project Grow, where the program’s support, tutoring, mental health services and parental engagement enabled her to blossom. “Karen’s grades increased, she is reading above grade level, and her teacher reports that her behavior has improved dramatically,” Matthew Constantine of Adopt-a-Family said. The 2018 Great Charity Challenge will culminate on Feb. 3, but its benefits are just beginning for thousands of people served by nonprofits throughout Palm Beach County. For the latest event information and application guidelines, visit www.greatcharitychallenge.com or www.facebook.com/greatcharitychallenge.